The Minneapolis Meditation Group held it’s first service on October 27, 1927 at the Hotel Radisson with 600 students present! Our Guru, Paramahansa Yogananda, had just completed his first series of lectures and classes in Minneapolis. Called a Self-Realization Fellowship (SRF) “Center” in the early years, our group was very active and large. 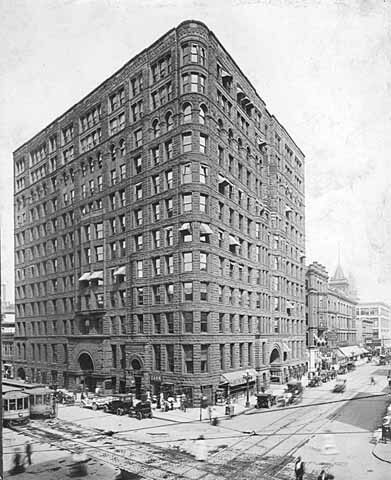 The Center was under the leadership of Mr. Stanley S. Staring, a leading Minneapolis realtor. 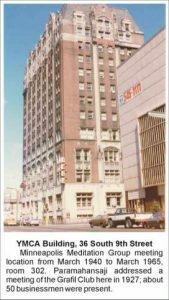 There were only about 20 SRF Centers worldwide in the early years and the Minneapolis Center was one of the strongest. 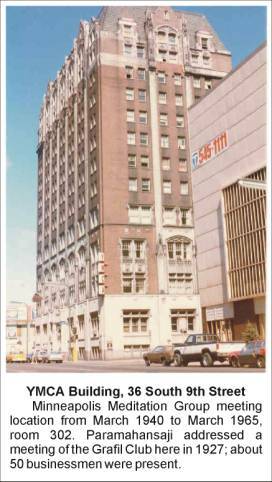 In the NEWS OF THE CENTERS section of the old Inner Culture and East-West (Self-Realization) magazines, the Minneapolis Center was a frequent contributor. There were many activities throughout the week for local devotees to partake during the early years. 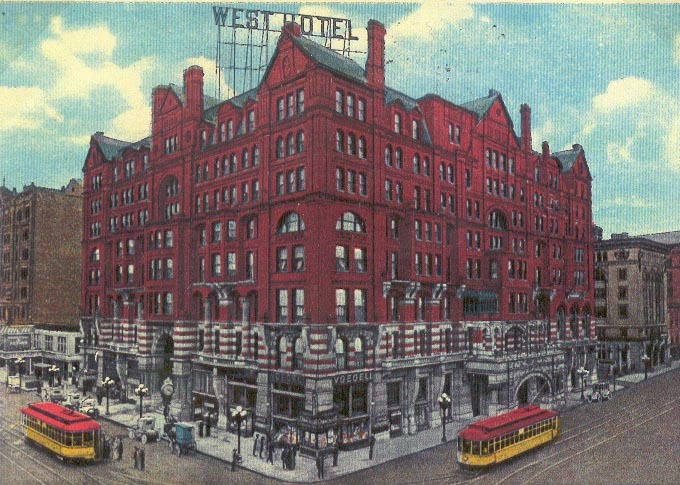 In addition to regular services on Sunday evenings, there was an open class at the “Center” (in downtown Minneapolis) on Monday evenings starting at 7:30 p.m. On Tuesday evenings starting at 8:00 p.m., a closed class was conducted. 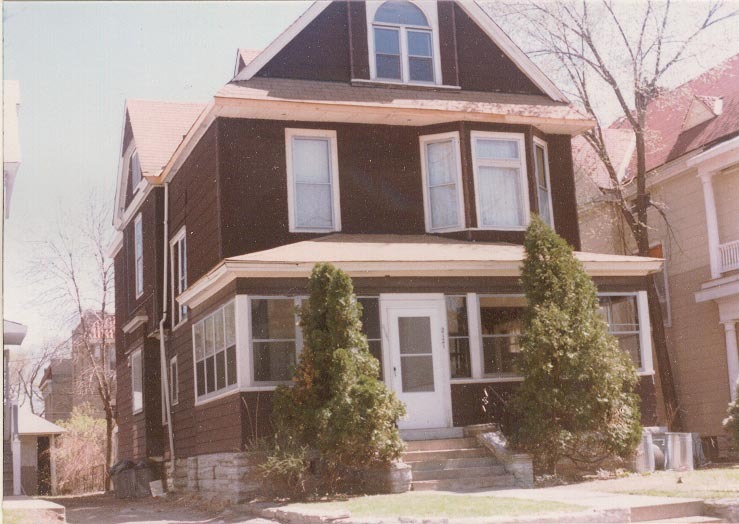 On Wednesday evenings, the “Inner Group” meetings were conducted at the home of Mrs. Elizabeth Backus at 2201 E. Lake of the Isles Blvd. until Mrs. Backus moved to the San Diego area in 1940. There were also noon meditations at the Center from 12:15 to 1:00 p.m. every day of the week, except Saturday and Sunday. 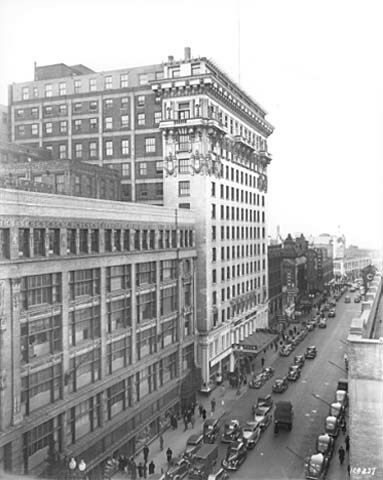 During one period of time in the 1930’s the Center was open from 11:00 a.m. to 5:00 p.m. daily. A reading group was held at 2121 Bryant Ave. So. and a rental library was available for devotees. The group had a Book Party in 1936 where admission was the gift or loan of a book to the Center Library. A special Candle Service was held at Christmas. One or more local devotees were authorized as “conducting teachers”, providing instructions for the various SRF “courses” as well as providing consultation for other devotees. 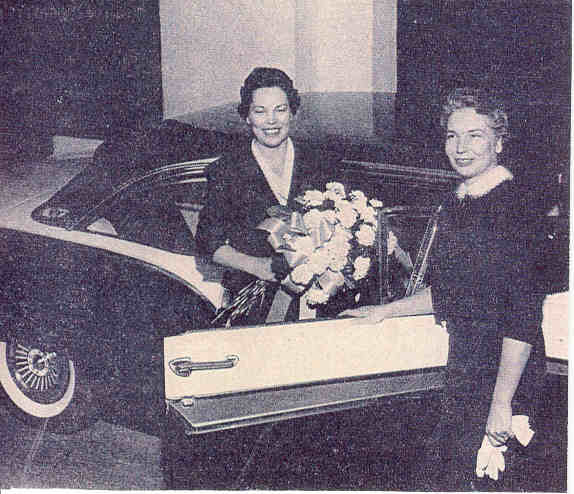 The group advertised its services in the Minneapolis newspapers. 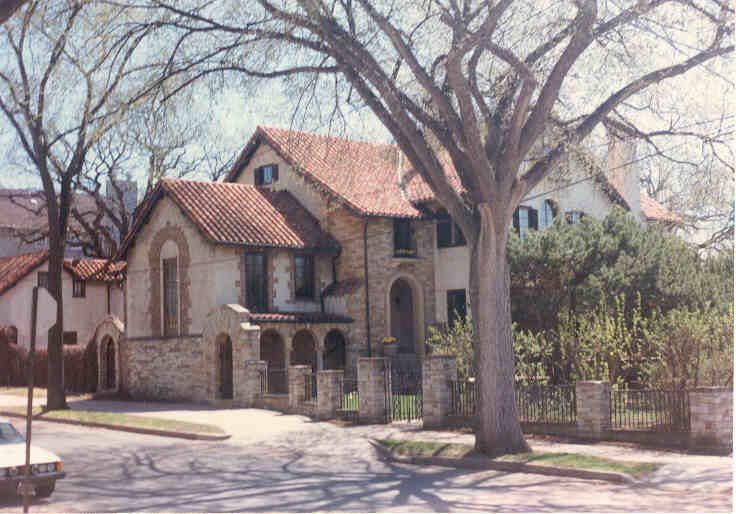 The Minneapolis Meditation Center held services at many locations throughout the early years. 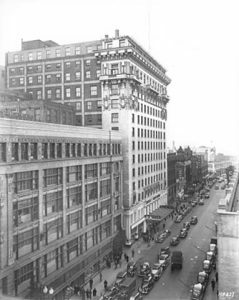 The most long-standing meeting locations for the “Center,” where all Sunday services as well as most other services were held in downtown Minneapolis, was in rooms 433-34 and Pioneer Hall (on the ground floor) in the Lumber Exchange Bldg., 5th Street and Hennepin Avenue (from prior to 1933 through 1938), and in room 302 in the YMCA Bldg., 36 South 9th Street (1940-65). 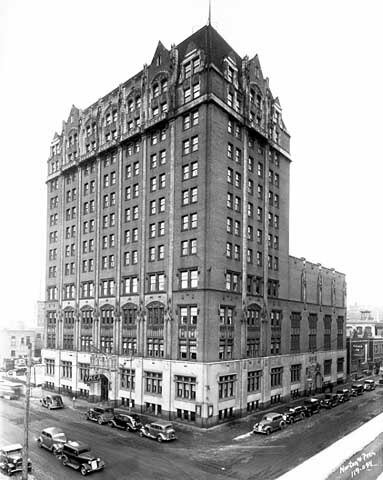 For shorter periods of time the Center was also located in the Gold Room of the Radisson Hotel, on 7th Street west of Nicollet Avenue (from Nov. 1927 – Feb. 1929 and again from Jan. – Mar. 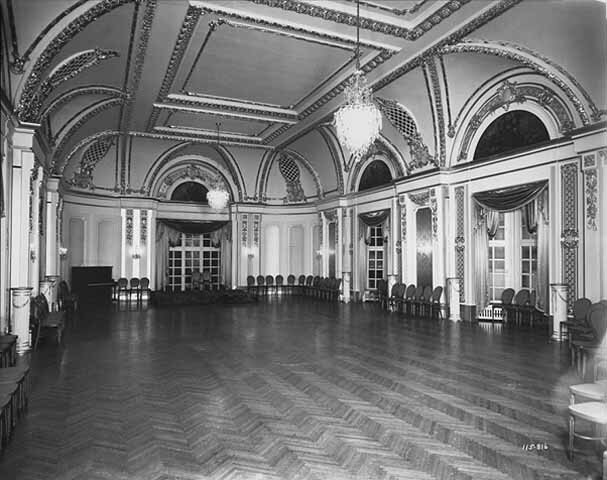 1939), in room 717 of the Plymouth Building at 6th Street and Hennepin Avenue (from prior to April – Aug. 1932), in the Metropolitan National Bank Bldg., SE corner of 6th St. and Marquette Ave., (Oct. 1932 – June 1933), and in the Colonial Room of the West Hotel, NW corner of 5th St. and Hennepin Ave., (April 1939 – Feb. 1940). 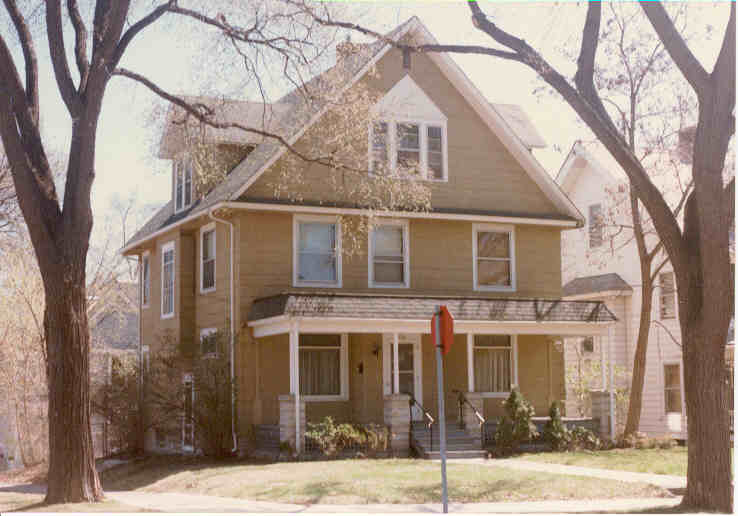 Midweek services and other functions for the Minneapolis Meditation Center were held in various devotees homes including 2915 Lyndale Ave. So. (1929-30), 2201 E. Lake of the Isles Blvd. 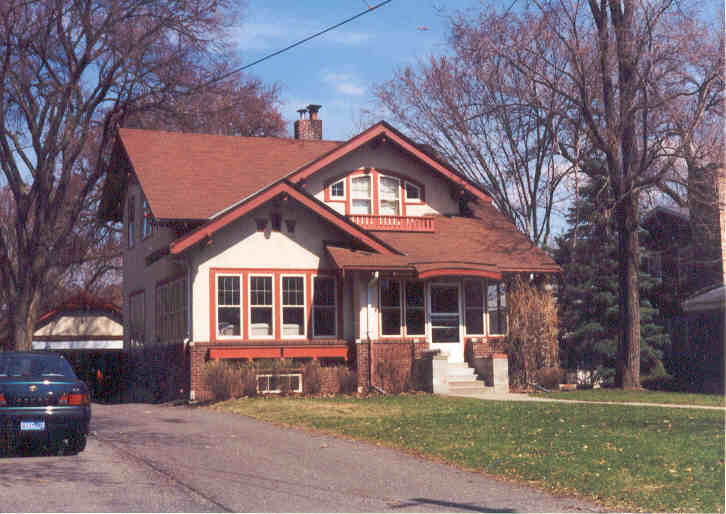 (from prior to 1933 – 1940), 2201 Girard Ave. So. 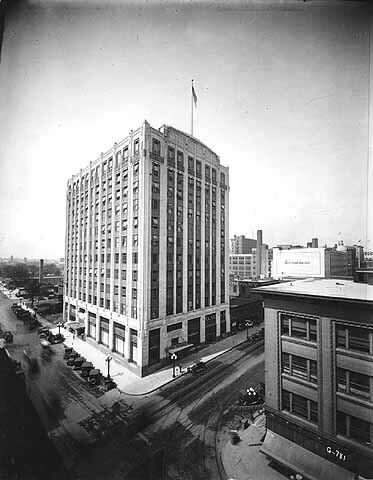 (prior to 1933-1934), 2121 Bryant Ave. So. 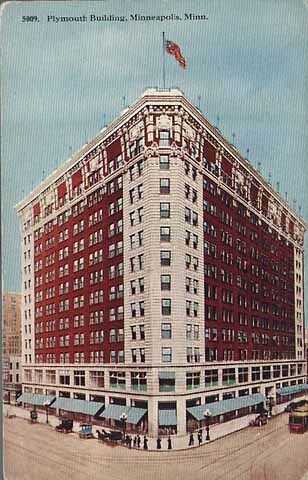 (1935-1936), 2215 Colfax Ave. So. (1936-1937), 4006 W. 44th St.(1937), and 316 Stonebridge Blvd in St. Paul (Jan. 1952 – June 1958). The group held social functions in addition to its regular meditation and other services. A Yogoda supper was held on the last Sunday of the month starting at 6:30 p.m., before the service. The Christmas party in December 1941 had an attendance of 52. 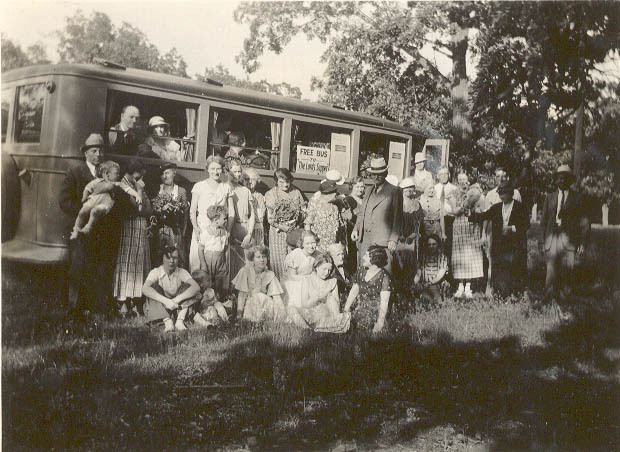 Picnics and “Home Coming” parties were also held periodically at places such as Minnehaha Park,Lake Harriet, and Lake Minnetonka. This picture was taken in the back yard of one of the devotees. One of these picnics in the summer of 1940 had an attendance of 71 devotees! 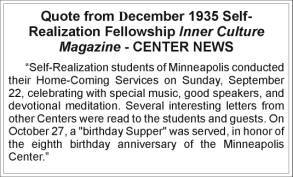 The Home Coming party may have been to commemorate the anniversary of the inception of the Minneapolis Meditation Center on October 27, 1927. The Minneapolis Center was very generous in sending donations to Mt. Washington on a regular basis. A Christmas donation from the group was mentioned in the January-March 1942 issue of Inner Culture. The group also responded generously to special requests from Mt. Washington for linen as well as for money to build SRF Temples in California. Mrs. Backus donated a magnificent, large pipe organ valued at $23,000 to SRF that was installed in the Chapel at Mt. Washington. For many years the Center maintained a “Temple Fund” and sent these donations to Mt. Washington as a contribution toward construction of SRF temples in California. 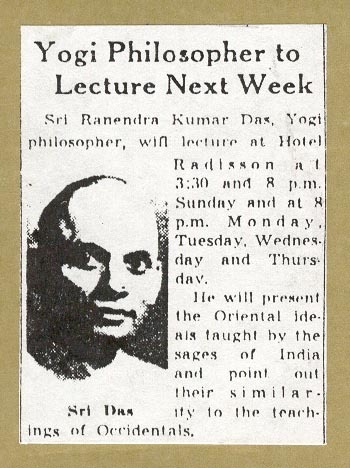 Sri Ranendra Kumar Das, traveling SRF teacher and lecturer, conducted services and lectures in Minnesota on numerous occasions during 1938-42. Large audiences attended the lectures and many students enrolled in the classes. 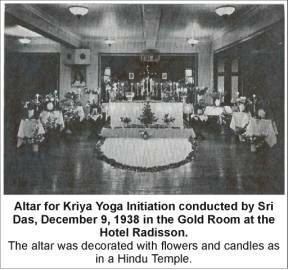 The Kriya Yoga Initiation ceremony for Minneapolis and St. Paul students, conducted by Sri Das on December 9, 1938 at the Hotel Radisson in Minneapolis, was a memorable occasion. The altar was decorated with flowers and candles as in a Hindu temple (see picture). Sri Das also entertained all Center members and their friends with a program of motion pictures taken at Mt. Washington and Encinitas. Sri Das infused new life into the ten-year-old Minneapolis Center during the visit. 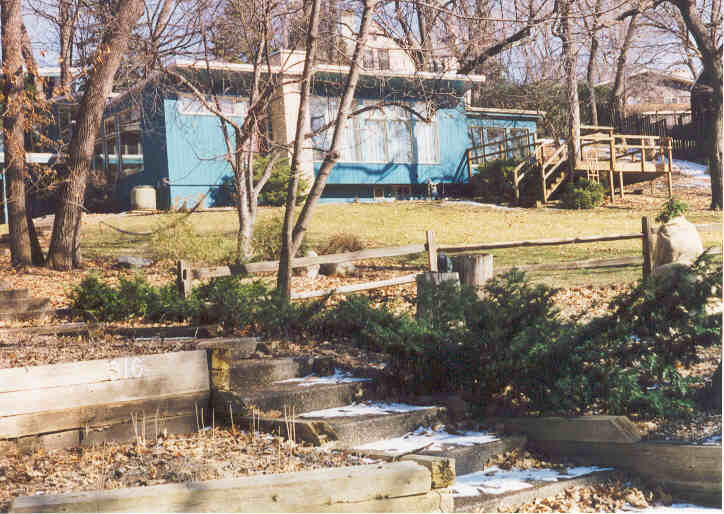 The managing council of the Minneapolis Meditation Center, called the Yogoda Trustees in the early years, generally met on a monthly basis to discuss the business concerns of the group. 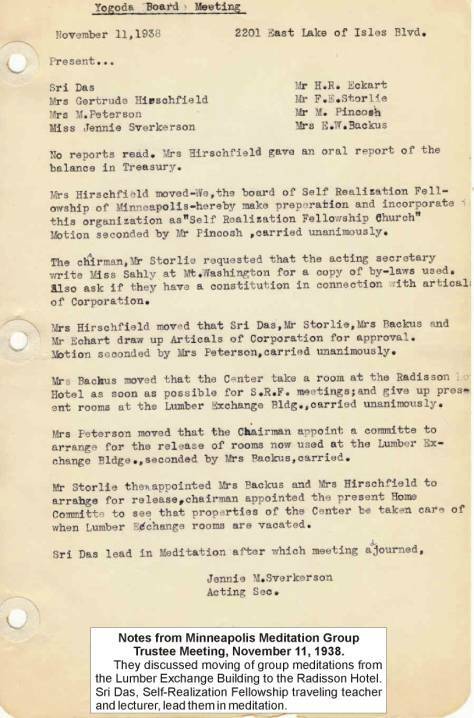 This is an example of the notes from a Trustee meeting held on November 11, 1938. Meetings open to the entire group were also held periodically. At the August 5, 1942 Trustee meeting a letter from Swami Yogananda was read! 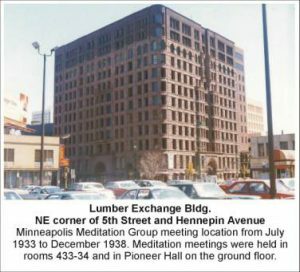 Services during 1940-65 were held at the YMCA in downtown Minneapolis, the most long-standing meeting location for the Minneapolis Meditation Center. Readings services were held on Sundays with a meditation service on Thursday evenings. A temporary altar was set up and taken down for each service. During 1952-58 a meditation service was held on Wednesday evenings at 316 Stonebridge Blvd. in St. Paul at the home of the leader of the Minneapolis Meditation Center. About 6-10 devotees came regularly to the services during these years according to the leader, who reminisced by phone about the early years with a current member of the group in 1998. Rev. R.C. Stanley of the SRF Lake Shrine at Pacific Palisades, CA visited the Minneapolis and St. Paul Centers in 1952. He showed color motion picture films of Paramhansa Yogananda that were taken at the dedication of the SRF Lake Shrine in August 1950. So delighted were the devotees that the films had to be run through twice. 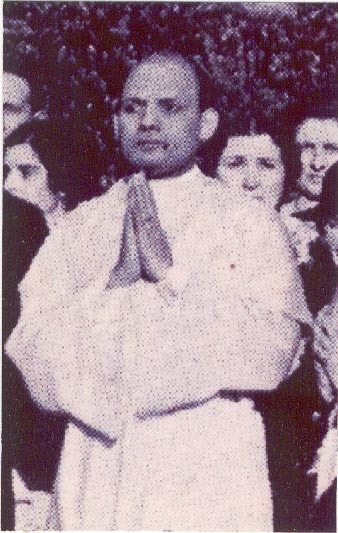 The Reverend Mother Sri Daya Mata, and Ananda Mata, visited Minneapolis and St. Paul during a business trip in the autumn of 1956. The Sisters were deeply touched by the devotion of SRF students to the ideals of SRF and to the beloved Guru Paramhansa Yogananda. 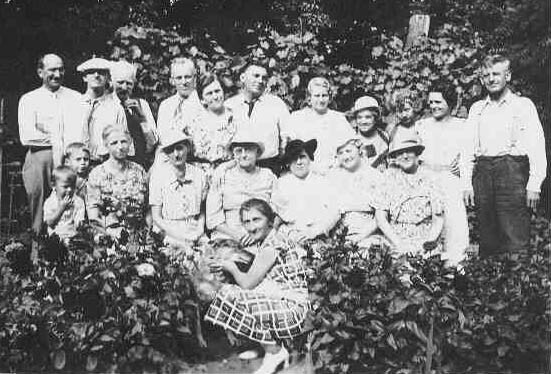 Many Minneapolis devotees attended the Convocations held annually in Los Angeles during the early years. For example, of the 225 students registered for the 1957 SRF Convocation, seven were from Minnesota, more than from all but 4 other States. 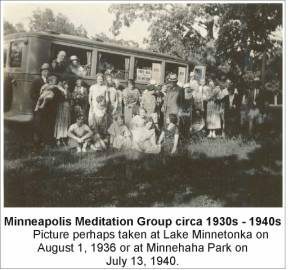 The Minneapolis Meditation Group held services through about March 1965 when the last listing is evident in the Self Realization Magazine. Services were not held for about the next 10 years. We do not know why the group disbanded in 1965 but it was likely due to a combination of decreased attendance and lack of local leaders.